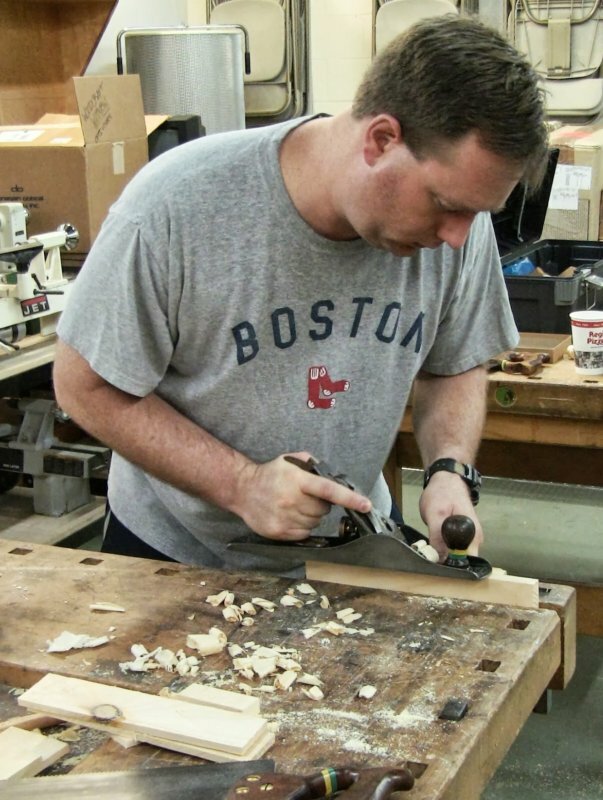 Having ripped and crosscut the larger board down, the student ripping a small piece down the middle. These are third-class cuts: just get the job done, don't worry about accuracy or appearance. This past Sunday I taught a class on using handsaws, handplanes, and chisels at Woodcraft in Woburn, MA. 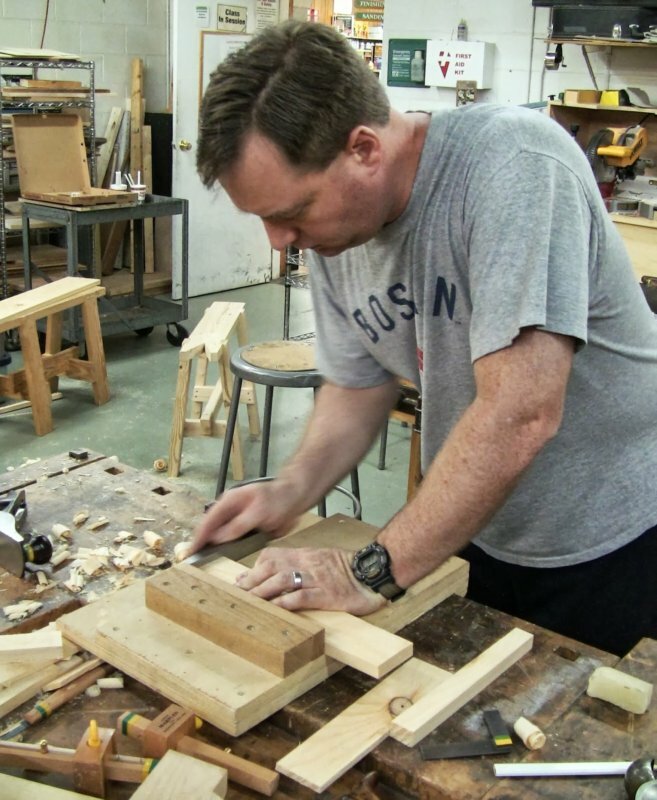 This was a whirlwind tour of the basic skills to break down and dimension lumber and start on joinery. There were three students signed up, but two didn't make it (must've been the Patriots game), so the third got a private class. 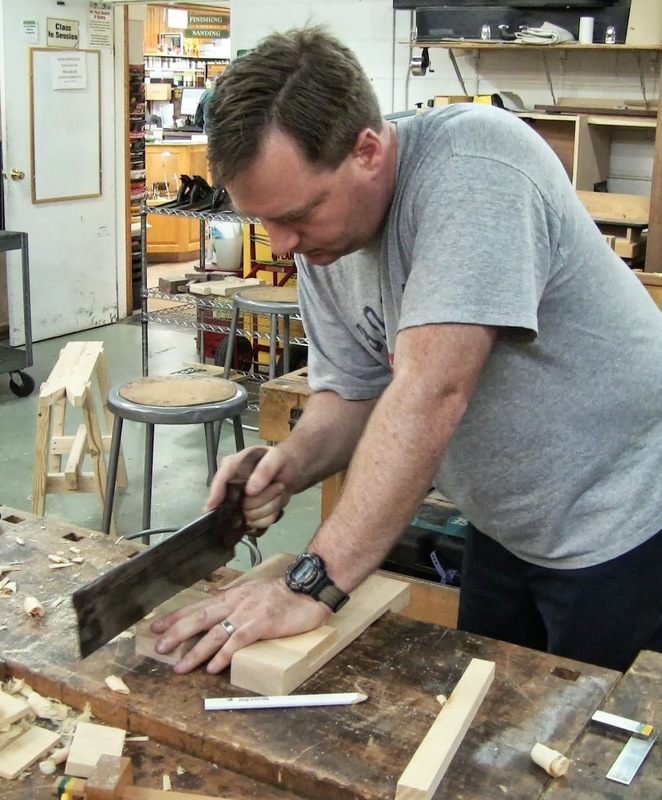 Sharpening: Planes, Chisels, and Saws, Sunday, October 6, 2:00-5:00 PM, $89. 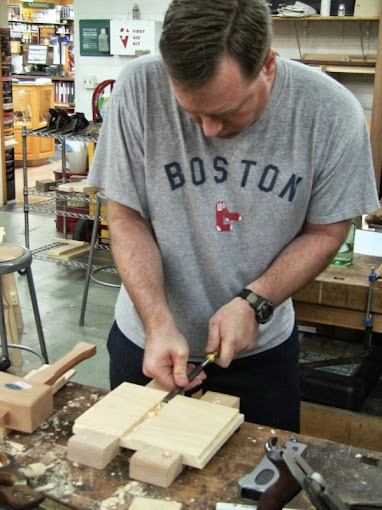 Hand Made Mortising, Sunday, December 8, 1:30-4:30 PM, $89. 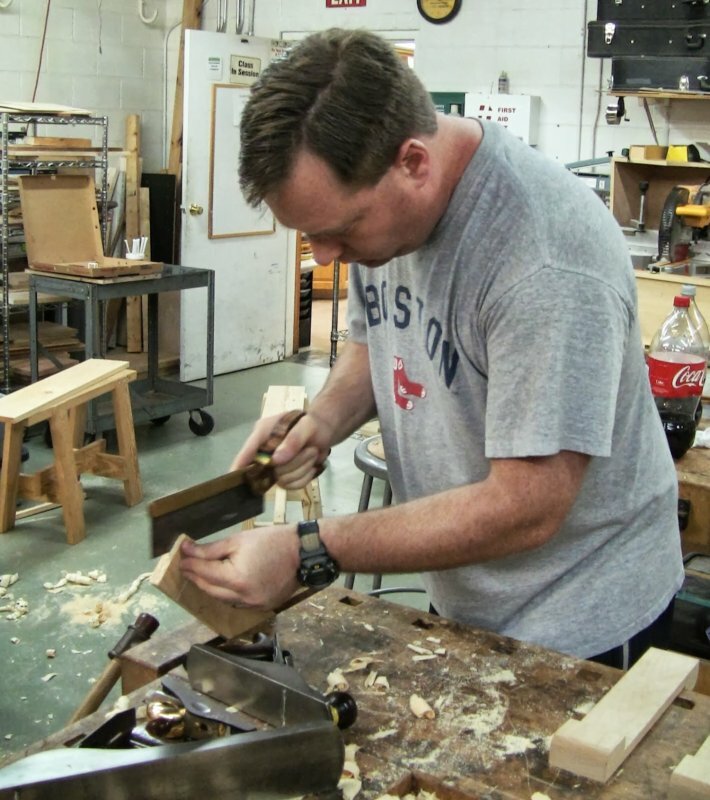 If you'd like to sign up, contact the store at 781-935-6414, or email boston-retail@woodcraft.com. And if there are some specific classes you'd be interested in taking, it's worth contacting them and letting them know. Half the challenge of scheduling classes is knowing what people want to take. Resawing one of the halves, another third-class cut. Planing the face, the first step of the FEWTEL sequence (Face, Edge, Width, Thickness, End, Length). 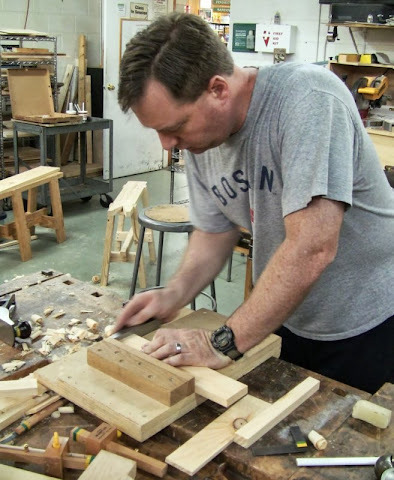 Shooting the end with his Lie-Nielsen low-angle block plane. 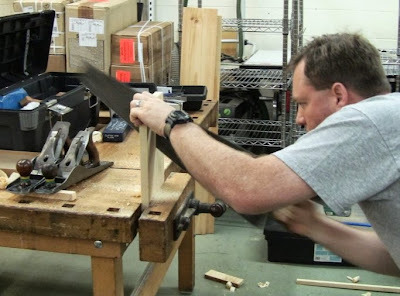 A second class cut: sawing down the cheek of a lap joint. This has to be accurate for proper fit, but will mostly be hidden. A first class cut: sawing the shoulder. This has to look good as well as be accurate. Cleaning the waste out of a dado. 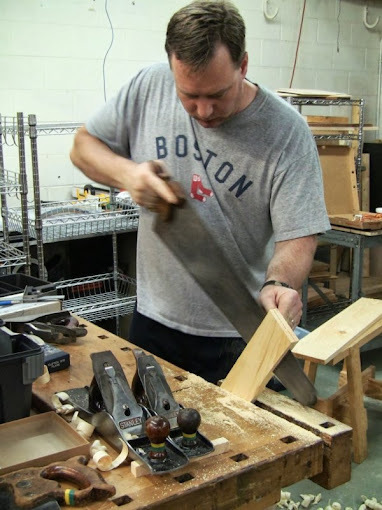 The advantage of doing these things by hand is that you can turn any space into a temporary or permanent workshop. A spare room, a corner of the basement, porch, garage, a garden shed. 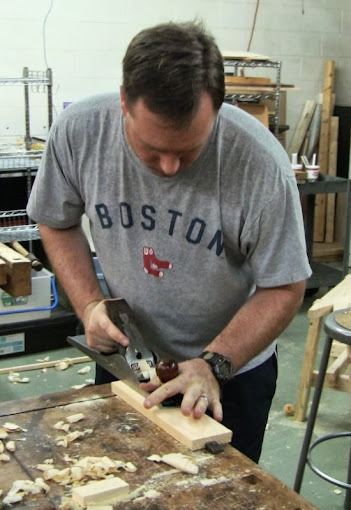 This is a great alternative if you don't have access to power tools. Or you can do it just for the pure fun.